Read The Resume Design Book as it was intended in full beautiful color with the Art (Color) Edition. Go beyond simply what to put in your resume, and transform yourself into a creative resume designer: learn how and why. What audience is it written for? 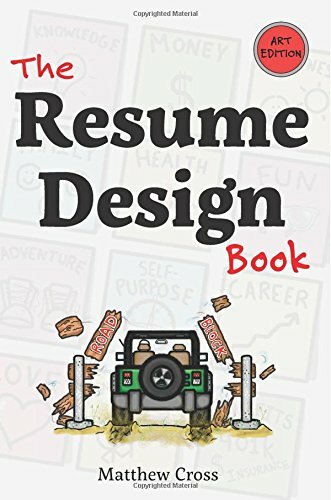 The Resume Design Book is written for current college students and soon-to-be graduates trying to differentiate themselves in an overcrowded job market. It is for those who want to rise above “automatic resume generators” and convince employers to believe that they are the right candidate for the job, not the competition. Inspired by design thinking, The Resume Design Book tells a story, your story. It starts with a blank canvas and guides you step-by-step until you are ready to submit your resume for your dream job. 1. Design thinking exercises for building a truly unique resume. 2. Innovative tips and tricks for an advantage over competition. 3. Over 100 original color illustrations to help you visualize and understand ideas, insights, and advice. Click cover page image below for a "look inside"